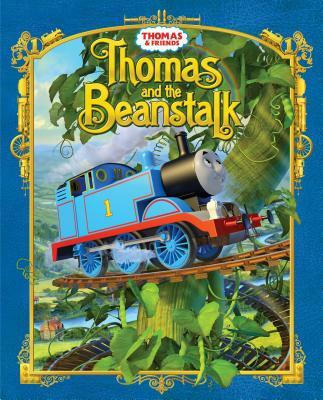 Thomas the Tank Engine stars in a retelling of the fairy tale “Jack and the Beanstalk.” Thomas tells his friends the story of Jack, the magic beans, and the giant beanstalk before bedtime. The next day, while carrying a load of beans, Thomas is bashed in an accident and dreams that he rides up a giant beanstalk to a land of giants high above the clouds. Thomas & Friends™ fans ages 3 to 7 will be riveted by this beautifully illustrated hardcover story—a familiar fairy tale retold in a thrilling new way, featuring their favorite little blue engine, his good friends Percy and James, a tiny golden steam engine, and a pinch of magic.